Butter  the everlasting delight of the gourmand, the faithful ally of the culinary arts, the constant symbol of good living. 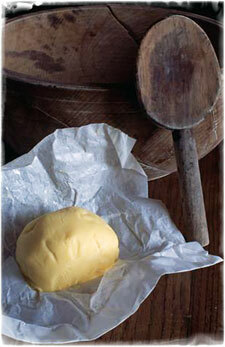 Butter is a culinary treasure as old as King Tuts tomb. "She brought forth butter in a lordly dish" (Judges 5:25). A jug of wine, a loaf of bread  and butter! Pure butter is produced today essentially as it was in King Tuts time, though butter made of milk from cows instead of camels or water buffaloes. It takes 21 pounds of fresh, wholesome cows milk to make each pound of butter like the pat of butter on waxed paper (at right) at a French farm in Brittany.